Yellow cestrum and blue bottletree. 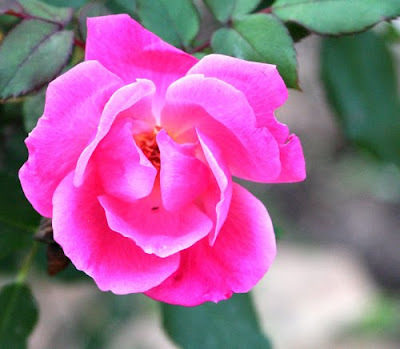 On my spring pilgrimage to The Antique Rose Emporium last year, I was looking around for some additional butterfly magnet plants to add to my garden. One of the attendants suggested to me that I try yellow cestrum. She said that she had it in her garden and that it did qualify as a butterfly magnet. Plus, it had made it through the just-ended cold winter and had already started blooming again. She assured me that the plant bloomed all year long. Uh huh, I thought, typical plant salesman hyperbole. I knew nothing about yellow cestrum, but I decided to take a chance on it. I brought the plant home in April of last year. It was in bloom when I planted it and it bloomed continuously from then until a killing frost in December finally put it to rest. Furthermore, every single day that it bloomed it was visited by butterflies. It seemed that the ARE attendant had not exaggerated after all. 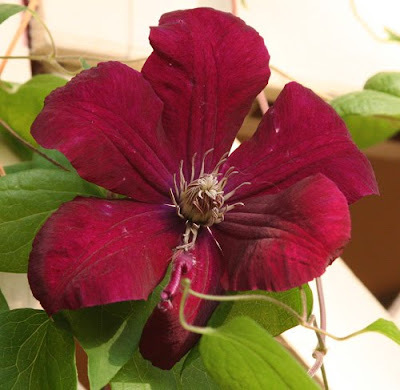 During the winter, I decided to move the plant, because, well, that's what I do. I move my plants around until I'm convinced that I've finally found the perfect spot for them. 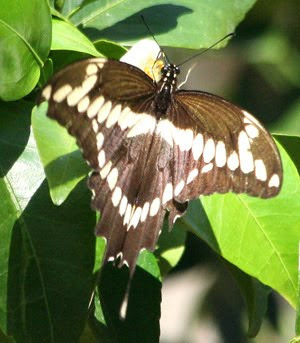 In the case of the cestrum, I wanted to move it closer to one of my backyard sitting areas so that I could sit and more comfortably watch the butterfly action around the plant. 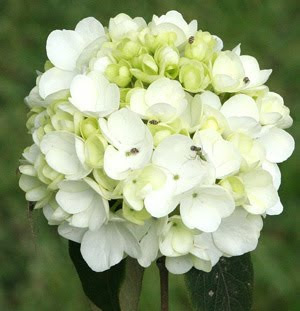 This, I thought, would be an ultimate test of the plant's hardiness. Several weeks ago, I moved it. The plant didn't miss a beat. 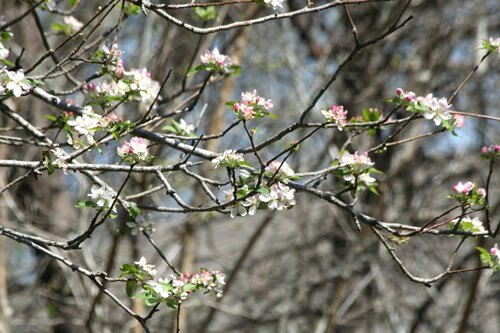 In early March, I noticed it was putting out tiny leaves and covering itself with bloom buds. Over the past week, those buds have been opening up. 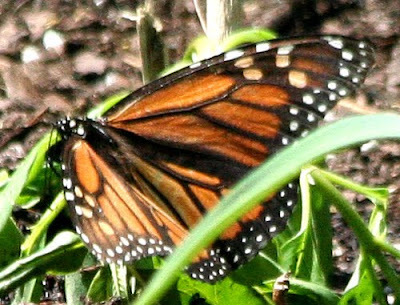 Just in time to feed my first Monarch butterfly visitor of the year. She arrived today and she was hungry! In addition to being hungry, she was obviously on a mission. I think she visited every single milkweed plant I have in the yard, including this one that was still wilted from having recently been moved. Didn't seem to bother the expectant mother. 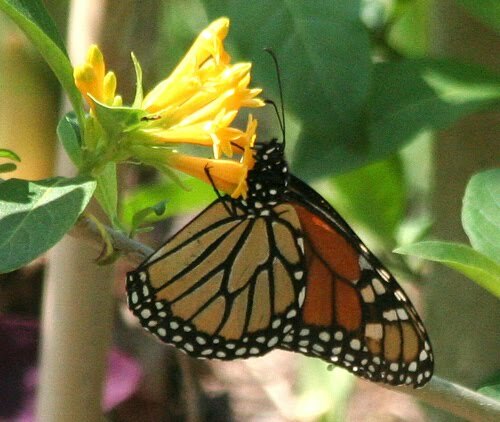 I worry about my poor little plants, though, because they are all just three or four inches tall, hardly big enough to support a big population of Monarch caterpillars. 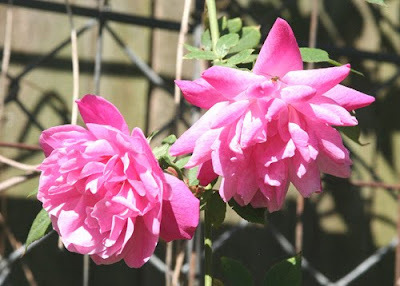 I've been intending to purchase some bigger plants from the nursery, but have been procrastinating, as I am wont to do. No more procrastination! The time has come. Tomorrow I WILL get more and bigger plants. An interesting thing happened while I was watching this butterfly. Another female Monarch dropped in and tried to visit the milkweed, but my first visitor was having none of that! She chased the interloper out of the yard! Maybe she realized there really wasn't enough of the plant to share. All the more reason to get more plants. But speaking of butterfly magnets, yesterday I got a couple of new citrus trees. 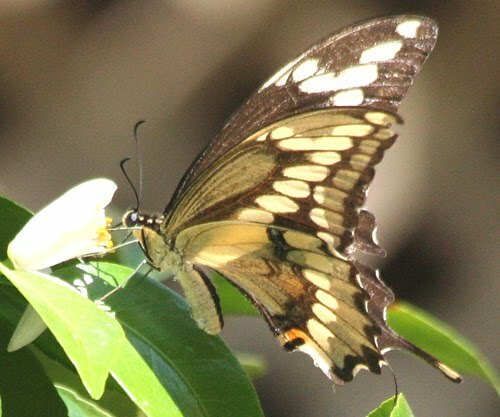 It didn't take long for the citrus-loving Giant Swallowtail to find them. This is a 'Page' Mandarin orange tree. 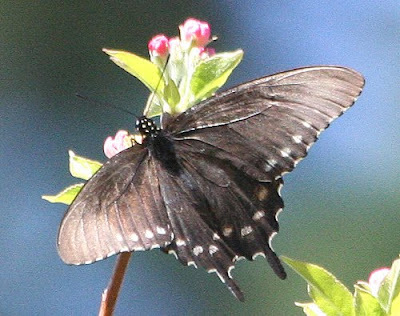 The butterfly spent a considerable amount of time visiting it and its blossoms. When it comes to butterfly magnets, it is strictly a matter of "to each his or her own." For Monarchs, the ultimate goal is milkweed but for the Giant Swallowtail, it's citrus. 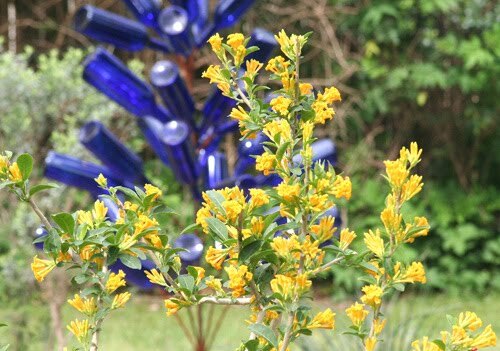 They both like that yellow cestrum though. No, not gardening by the light of the moon - although you could certainly do that tonight. 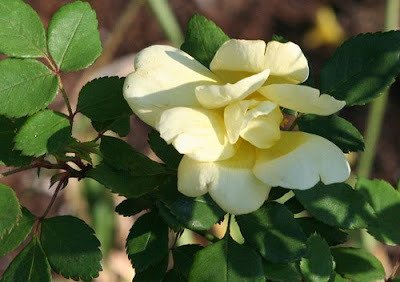 My title actually refers to planning your gardening activites by the phases of the moon. All the news this week about tonight's "Supermoon" started me thinking about this again. It is an interesting concept, although I must admit that I don't actually give a lot of thought to the phase of the moon when I plan what I'm going to do or what I will plant when in the garden. I know many traditional gardeners swear by this lore, and who am I to say they are wrong? At the time of the new moon, when the moon is dark, lunar gravity pulls water up and causes seeds to swell and burst. Following the new moon, as the moon shows a little more of its face each night, the power of the moon is increasing and this creates a time of balanced root and leaf growth. It's a good time for planting above-the-ground crops that produce their seeds outside the fruit. 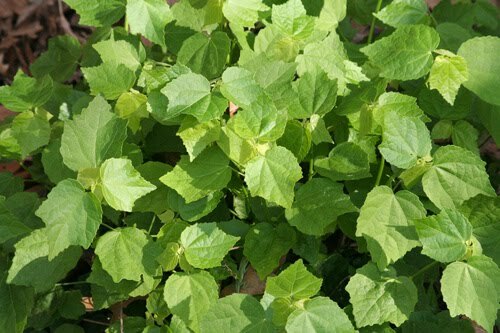 The second quarter of the moon is conducive to strong leaf growth and is a good time to plant above-the-ground crops that produce their seeds inside the fruit - things like melons. After the full moon, the gravitational pull is high, pulling moisture up through the soil. This is believed to be a good time to plant root crops. 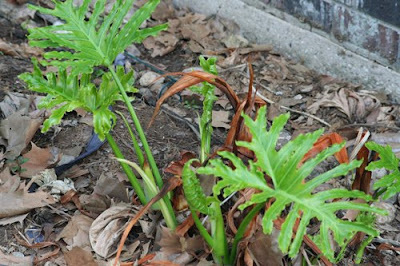 It is also considered to be a favorable time for planting perennials, biennials, bulbs, and for transplanting because this is a time when active root growth is stimulated. The fourth quarter of the moon is considered a resting phase. 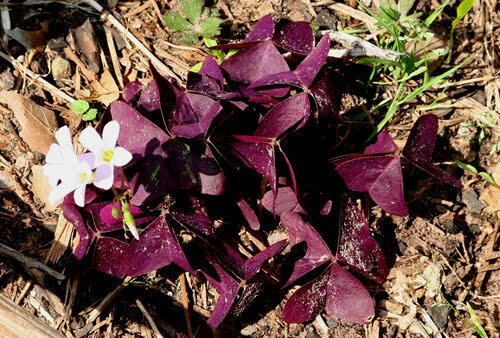 This is the time to cultivate, weed, and to mow your yard. Whether you buy any of this or not, there is one thing you cannot possibly dispute. Tonight's full moon is super! I've just come inside from watching her and now I think I'll go back out and visit her again. After all, she's closer than she has been in 18 years. It just seems unfriendly not to give her a wave and say "howdy"! The angel's trumpets are sending up green shoots. The Turk's caps are coming back strong with lots of green. 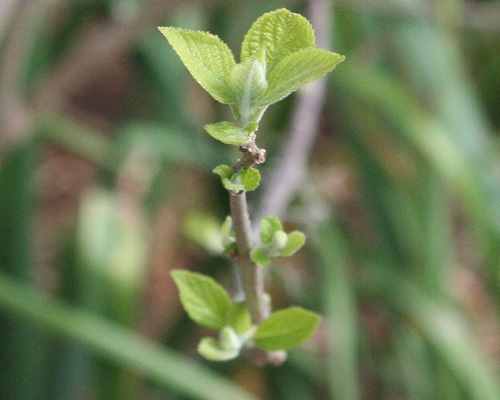 The beautyberries are putting out tentative green buds. 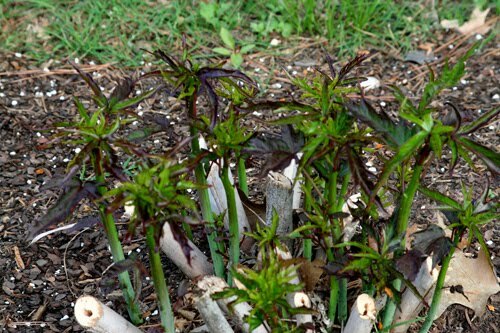 Split-leaf philodendrons are greening up, too. 'Texas Star' hibiscus grows greener every day. 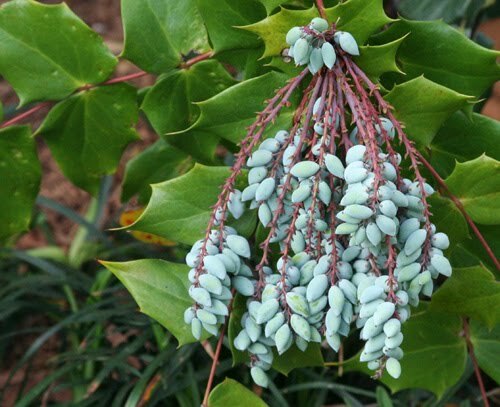 'Leatherleaf mahonia' which bloomed all winter is now loaded with these bluish green seeds. 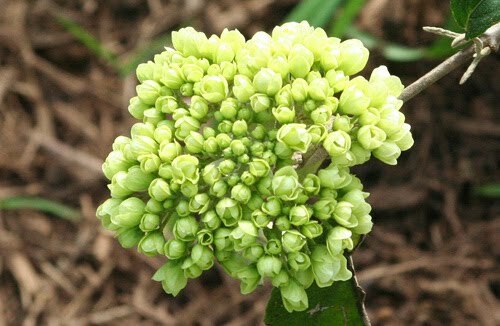 Even the snowball viburnum's buds, not quite fully blooms yet, are green. 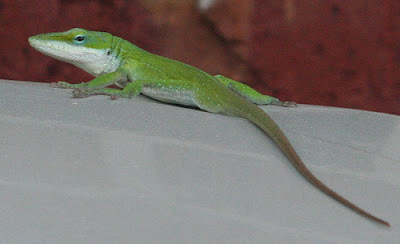 Of course, the anole always wears his green - except when he's passing as brown. ...the shamrocks (oxalis), which are purple. Guess they don't have to prove their Irishness! 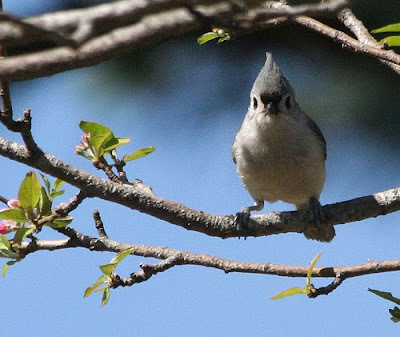 The calendar says it is five more days until spring arrives, but here in Southeast Texas, spring has been softly creeping into our yards over the last few weeks, until finally, one early morning in March, I opened my back door and looked out onto the first true spring day. Nothing says "spring" like apple blossoms, and my old tree has been in full bloom over the last several days. Honeybees come from all around to sip from those blossoms until the whole tree fairly buzzes with excitement! 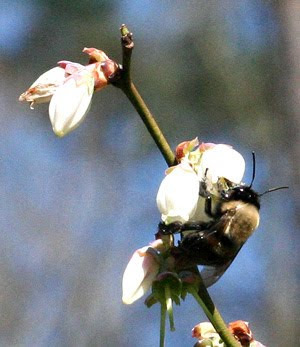 The big fuzzy bumblebees, though, seem to prefer the bell-shaped blueberry blossoms. 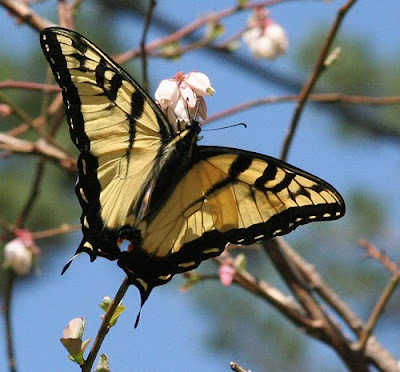 This Eastern Tiger Swallowtail butterfly likes them, too. Spring in Texas, of course, means bluebonnets. Mine are still pretty sparse, but they should fill in nicely in a few more days. The roses are joining the party, too. Last year, I had moved 'Old Blush' during the winter and she pouted all year, never giving me the kind of blooms she normally does. This year, it looks like she has forgiven me and can't wait to show what she can do. 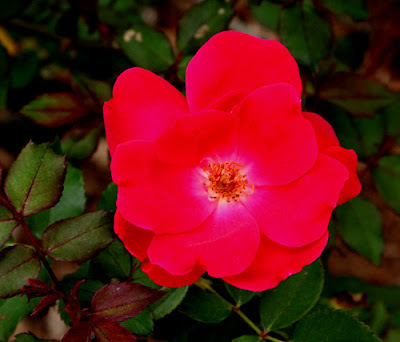 She was the first of my roses to bloom. The Knockouts followed close behind. Next up was the pink Knockout. Finally, just in time for Bloom Day, the sunny yellow 'Radsunny' is chiming in with a bloom. 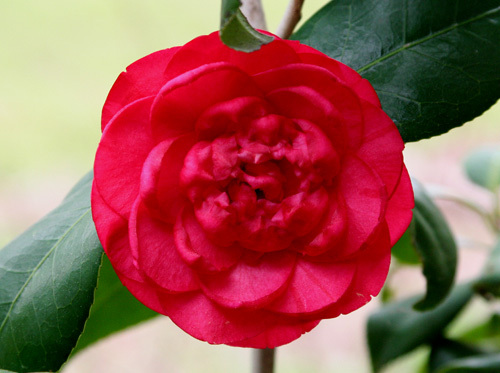 We can't have spring in the South without a camellia blossom or two! This one is anonymous, like many of the plants in my yard. 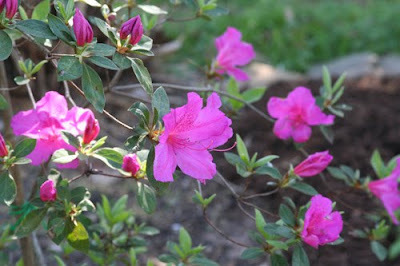 And, of course, we must have at least one azalea. 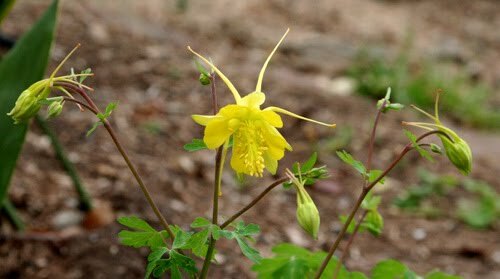 Hinckley's columbine is a pretty spring bloomer here. 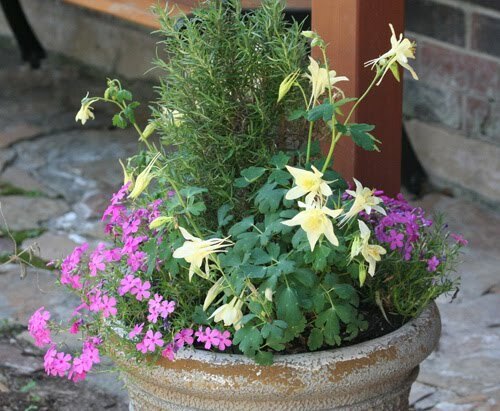 In a pot near the front entry, some yellow columbines team with phlox and rosemary. The dainty little leucojums are almost past their bloom by now. Meanwhile, the loropetalum is a mass of color in fuchsia and purple. 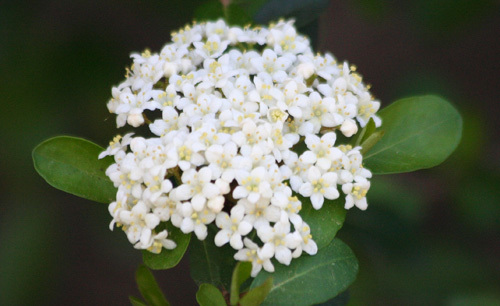 The dwarf 'Walter's viburnum', installed last fall, is giving me its first season of bloom. 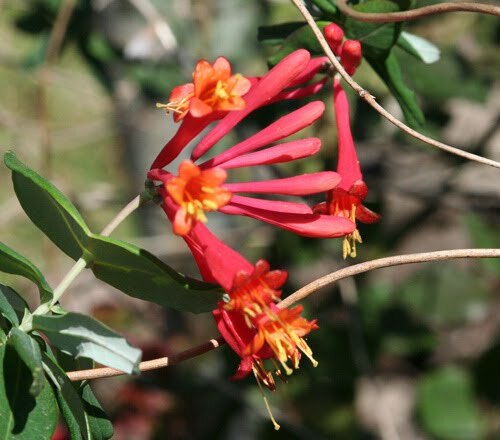 The coral honeysuckle couldn't even wait for spring. 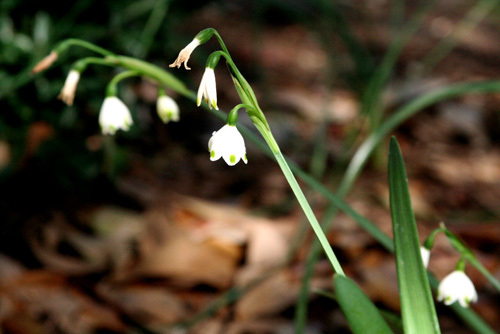 It started blooming in mid-winter. 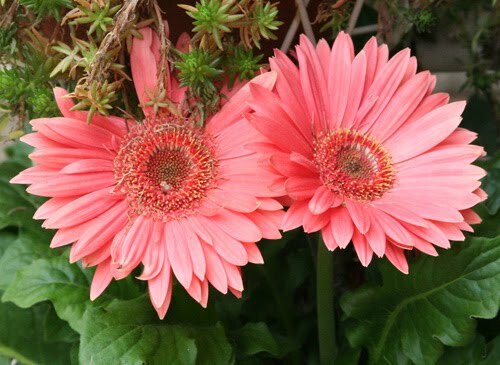 There are no happier faces in the world of flowers than daisies. 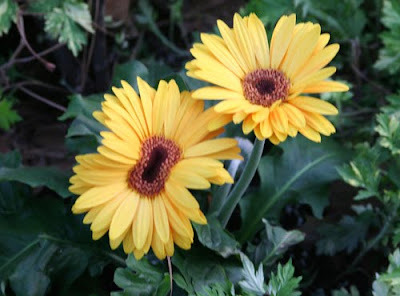 Like these gerberas. 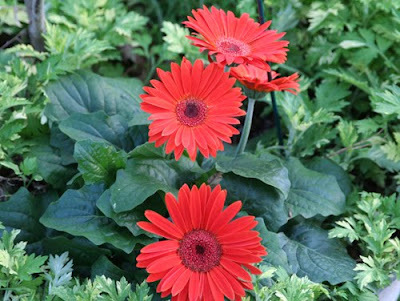 Coral is a color that is popping up all over my garden this spring. 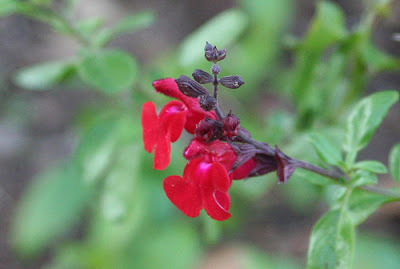 There's this 'Coral Nymph' salvia, a very early bloomer. 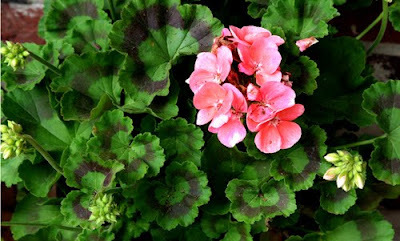 And then there is the coral geranium that welcomes visitors at my front door. 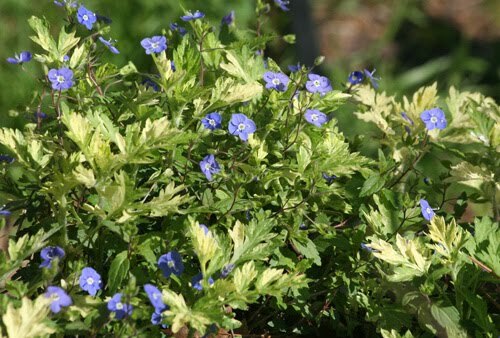 Sweet little creeping veronica 'Georgia Speedwell' blooms among some variegated artemisia. 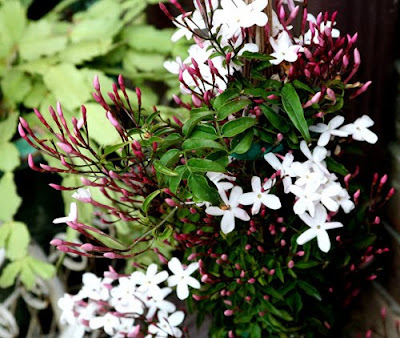 And speaking of sweet, there is nothing sweeter than jasmine. This one is still sitting in its black plastic pot, waiting for a permanent home. 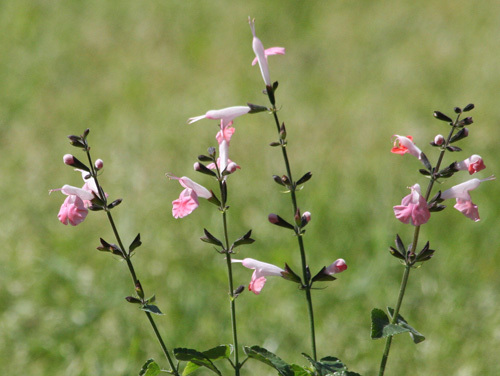 All the "springiness" in the air has even encouraged the Salvia gregii to start blooming. 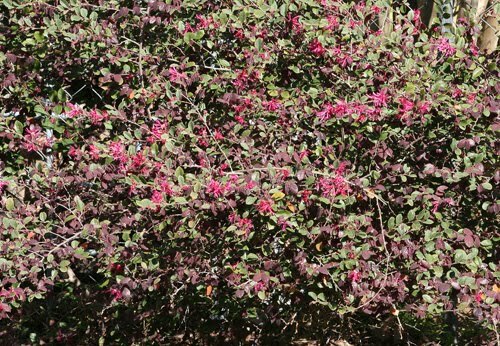 It may be popularly known as autumn sage, but here it blooms almost all year. This plant had just shut down blooming in January. Now here it is again! Spring will do that to you. I hope you are enjoying the season where you are this Bloom Day. Thanks for visiting me and thanks to Carol of May Dreams Gardens for thinking up the concept of Bloom Day and for hosting us each month. 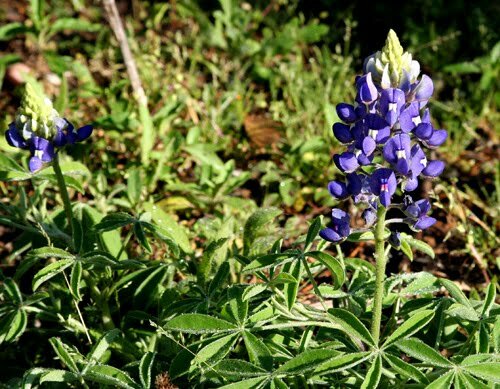 Here's a valuable tip for you if you are going to attend one of the lectures conducted by Dr. William Welch and Chris Wiesinger, the "Bulb Hunter", at The Arbor Gate: Get there early. Their latest class was held last Saturday morning at 10:00 A.M. and to say it was well-attended would be an understatement. Based on my previous experience, I did get there early so I was able to snag a front row seat, as well as find a place to park in the parking lot. Late arrivals had to park on FM 2920 and walk up to the venue. The Welch and Wiesinger show this time around was all about "Refining your garden". Their focus was on plants and garden activities that local gardeners can do now in order to have beautiful outdoor spaces that will last the whole year. Their plant suggestions included bulbs and perennials that "create beautiful livable and sustainable landscapes with manageable maintenance routines." The operative words here are livable, sustainable and manageable. I always enjoy these two gardeners' presentations because they tend to emphasize tried and true plant selections that are appropriate for our southern humid climate - plants that are not going to poop out on us when the going gets tough in July and August. And sometimes in September and October and... well, you know. 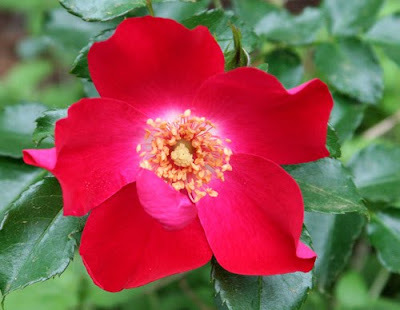 All of the recommended plants can - and should - be planted now, and, at this time of the year, W and W remind us, it is especially important to look around the garden for dead plants after the winter freezes, plants that can be replaced for more color for spring, summer and fall. Also, they remind us that most of these plants can be grown in pots as well. But it's not all about new plants. 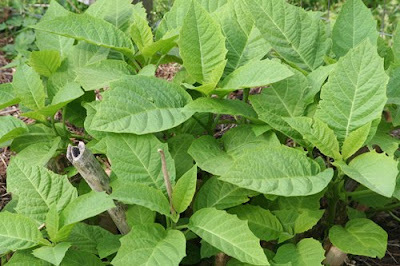 Now is a great time to add mulch to keep down weeds, help retain moisture, and to keep your plants more comfortable during the long summer. This is important for new plants, but it's also important to remember your established plantings and renew their mulch. It is such a treat to listen to these two knowledgable men talk about gardening and I'm happy to be able to share with you some of what I learned from them, but, by all means, keep an eye on the listings of garden events in the Chronicle and try to get out to hear them yourself the next time they are in town. And remember: Arrive early! 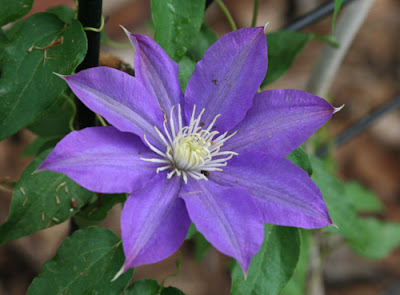 Even the most dedicated gardener can't spend ALL her time weeding and planting and pruning. Every once in a long while she has to spend some time just appreciating the garden, observing it, and becoming one with it. That's what I did today. Oh, I might have done a little desultory weeding and maybe I nipped off a dead branch here and there and I did actually complete one chore that I had intended to do a few days ago. I planted my 'Brandywine' tomatoes that I had started from seeds under my grow lights back in December. (It's an absolute certainty that these tomatoes won't be able to withstand our heat, but I'm hoping that by getting them into the ground this early, they will have a chance to produce some of their delicious fruits before the worst of the heat arrives.) Other than those few little tasks, I mostly just sat and enjoyed the garden and the garden's visitors today. 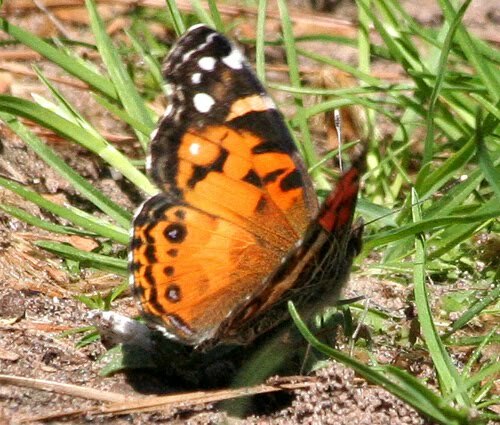 This colorful visitor is an American Painted Lady. She was shy and didn't really want to pose for a picture, but like a good papparazza, I chased her until I was able to get a few candid poses. Didn't have to chase this guy! This very, very long anole was lazily sunning himself on a crape myrtle tree. 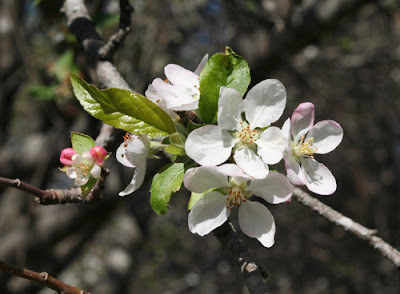 The old apple tree is in full and glorious bloom now and it is pulling in the traffic. 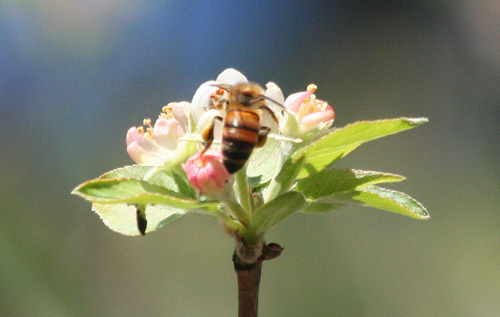 Bees come from far and near to sip at its blossoms. 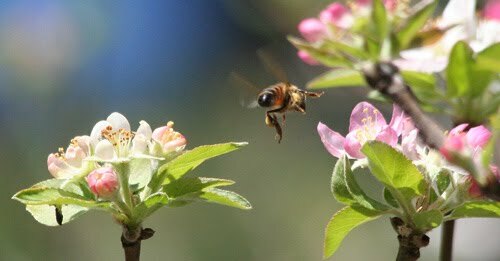 You can hear the buzz of hundreds of bees from several feet away. At all seasons of the year, the tree is a favorite perching place for the Tufted Titmouse. 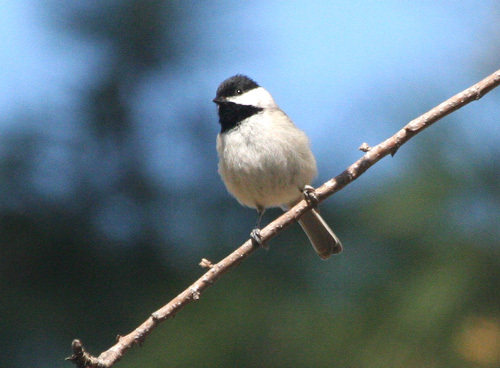 Their little cousins, the Carolina Chickadees, like it, too. 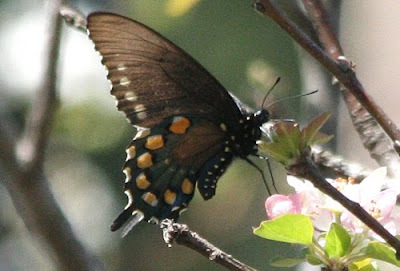 This Pipevine Swallowtail butterfly has been hanging around the tree for a few days. In this ventral view, you can count the seven large orange dots that confirm his identity. On such a beautiful Sunday afternoon, it was wonderful to be able to just sit in my favorite chair and drink in the peaceful atmosphere of my favorite place to be - my own backyard.